When new owners, Jim and Claire Alexander bought The Killingworth Castle at the end of 2012, it was a relief to take down what remained of the crooked, plastic brewery letters that represented the long-term neglect of a once proud and focal building in the village of Wootton. The letters’ removal also revealed the date stone (WS & K) on the front of the building as 1637, now visible next to the new signage. It is thought that the pub was built by a Thomas Killingworth. The Killingworth family is thought to have originated from the North of England where the name crops up around the Newcastle area. The inn was situated on the main road from London to Worcester and Aberystwyth, a veritable 17th century motorway by today’s standards. The structure was built of local stone, quite possibly from the quarry that used to be situated just yards up the road. It is possible the building started life as a farmhouse and later became an inn as brewing beer was a common method of supplementing a farmer’s wages around that time. Also the building’s stabling was extensive, with part still retained under pub ownership and the other section now a private residence on Castle Road. The village is known to have had up to four pubs though time. When Thomas Killingworth built his ‘castle’ down by the main ‘Woodstock Weye’ road, he mainly attracted travelling trade and villagers who used the spring across the road. Through time the building has been changed a considerable amount, but you can still see the County Firemark on the top of the front wall of the pub: a black square that indicated that the pub had insurance. Without the mark the Fire Brigade would simply not help in an emergency: quite a comparison to today’s culture of health and safety. 1637 – Built by Thomas Killingworth. 1680 – Thomas died and the pub was run by his son William and wife, Silence. 1719 – The road was a turnpike and became important for the carriage of goods until the railways came in the 1830s. 1740s – The stable range was constructed. 1767 – Catherine Hedges is registered at the inn. 1768 – Then known as The Red Lion, the inn was listed for sale with enquiries to Mrs Hedges. 1769 – Run by Sidebotham. 1772 – Advertised to let. 1773 – Mark Higgins recorded at the Inn and the family stays until 1915 (142 years). 1780s – The left hand side of the inn was added as a self-contained cottage. 1877 – A clubroom for village functions is documented above part of the stables. Late 18th / early 19th Century – barn was erected for malt storage and a third story added. 1919 – Belcher and Daniels became trustees. 1930s – Winston Churchill used to test his cars on drives out to the pub from Blenheim Palace. He was often accompanied by his friend and founder of the Morris Motors, William Morris. 1935 – Belcher and Habgood acquire the freehold. 1939 – Around the outbreak of WW2 the hugely popular landlady Mrs Ida Clarke took over the helm. Affectionately known as ‘Ma Clarke’ or ‘Aunty Ciss’, along with her husband Syd, they ran the business during wartime and were famous for their determination in providing beer to the locals (at the expense of selling to locally billeted soldiers). She retired in Wootton and was known to have her 100th birthday at the pub. 1944 – Morland & Co. officially take over the freehold having acquired Belcher & Habgood. 2012 – Freehold bought by Yubby Inns, a new company formed by Claire and Jim Alexander, owners of the multi-award winning pub, restaurant and B&B, The Ebrington Arms in Ebrington near Chipping Campden. After a huge refurbishment programme, the pub is reopened in time for Christmas. 2013 – The pub is named ‘Restaurant of the Year’ by the Oxford Mail and Times. Two new dining rooms were added into the old building after new phase of renovations. The garden, that had been metres tall with weeds was landscaped and al fresco dining area created. The pub was awarded a Michelin Bib Gourmand and was named ‘Pub of the Year' again by the Oxford Mail. 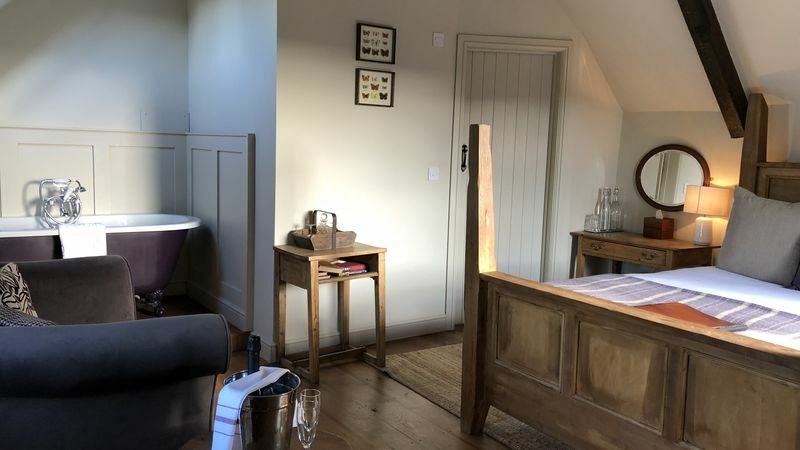 Another big renovation project ensues, with the addition of eight new ensuite letting bedrooms in the adjoining stable block. Rooms open for business and pub awarded runner-up in CAMRA North Oxon Pub of the Year. Plans to add new private dining area. Thank you to local historian Sally Stradling, part time tutor in Vernacular Architecture at Oxford University (OUDCE) and Heritage Consultant /adviser on historic/listed buildings and landscapes.